The Seal Beach PSOC Committee recently made a child’s wish come true. A recent visit of the Philharmonic Society of Orange County “Music Mobile” to College View Elementary School in Huntington Beach inspired a student to learn to play the trumpet. Nine-year-old David Johnson was enthralled with the Music Mobile’s hands-on demonstration of musical instruments. He was particularly interested in the trumpet, showing a natural talent and professionalism as he handled the instrument. 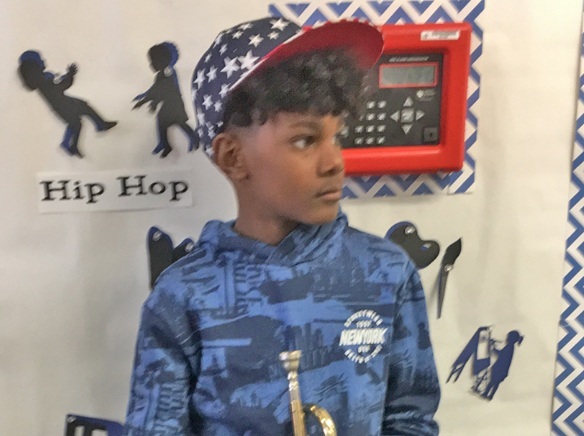 After his experience, he begged his mom to get him a trumpet of his own. The Seal Beach PSOC Committee granted his wish, with a trumpet for David donated by member Michael Tribble. David will be playing his new trumpet soon, thanks to the generosity of several other Seal Beach Committee members who have volunteered to pay for music lessons. But there’s more to this story: Steven Parks, a friend of Seal Beach PSOC member Janice West, has donated a second trumpet for David, a “Doc Severinsen” model by Eterna, a top-of-the-line professional instrument. This larger trumpet has been promised to David when he’s a few years older and has mastered the beginning instrument that he now has. David will soon begin music lessons, learn to play his instrument, enriching his life with music, artistry, discipline, and the pride of his accomplishment. This is what PSOC is all about.